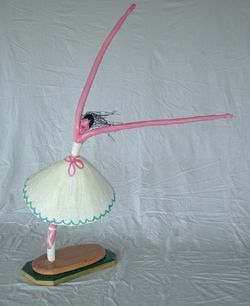 Swan... is a wood sculpture made of cedar branches and a Douglas Fir core was used for the tutu. Graceful wire hair and a hard maple dance studio floor. Sheâ��s painted and finished with water based products. Its hot, its exciting, itâ��s her time to gain the advantage. 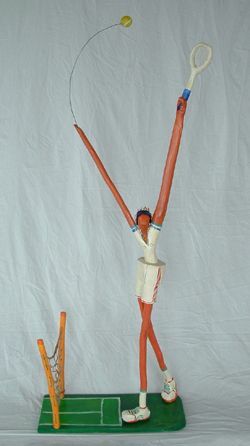 Deuce... is a wood sculpture made of cedar branches ,She sports a great tan and is wearing the latest in eye protection. Graceful wire hair and a hard court to play on. Carved shoes and racket. Sheâ��s painted and finished with water based products. 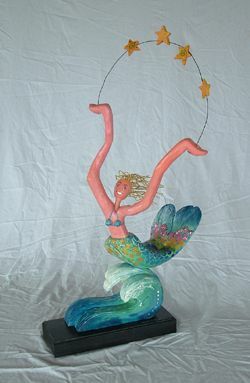 She skims the top of the waves, juggling the stars that she calls on when sheâ��s in need of joy. 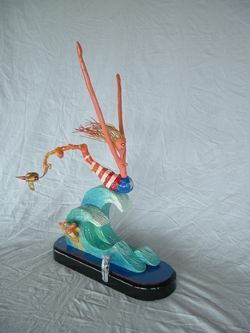 Aqua... is a wood sculpture made of cedar branches.Her lower body is driftwood, the waves, stars and her hands are carved out of poplar. She sports long blonde wire hair and a great smile. Sheâ��s painted and finished with water based products. She skims the wave tops with her buddies making sure that the ocean are fun to play in. Twirle... is a wood sculpture made of cedar branches. Her body is a root burle. The waves, telescope and the dolphins are carved out of poplar. Twirle is painted and finished with water based products. She smiles, she girates around a pole of gleam, sheâ��s stacked and she knows it, she likes it, sheâ��s a STAR. Star... is a wood sculpture made of cedar branches. 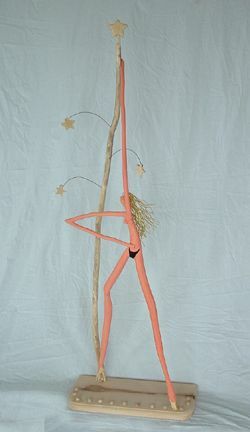 Her body is cedar, her dance floor is alder, her long blond wire hair flows when she dances to the music.. Star is a work in progress and will receive a coat in good order.